Yes, that's right....I am making the move to non-seasonal blogging with the launch of Craftbotic. I am really excited about the move; but don't worry, my Christmas blog will run alongside it...so keep following! It would be really awesome to see you over at the new pad. 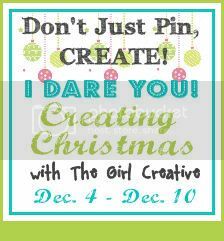 I have some great guest posts coming up, a giant link-up and lots more. I can't belive how long it has been since I posted anything. I have been back at home catching up with my family, and more seriously work. January is a mega busy time for me. Although I would rather be making stuff to share on my blog (using my first ever sewing machine), I have a 5000 word paper to study for and write over the next 3 weeks, my normal work as a teacher and staving off the many bugs going around. I've really missed updating my blog; although it has given me a chance to read a lot of other people's posts and enjoy them. I have found some new (to me) blogs and even managed to start my first board on Pinterest inspired by some of the lovely things that I have read. So, I am postponing New Years resolutions, projects and craft until I have done my essay, so things might be a little quiet around here. However, the exciting news is that I have decided to keep blogging! What was going to be a journal of my Christmas projects has started to become so much more. 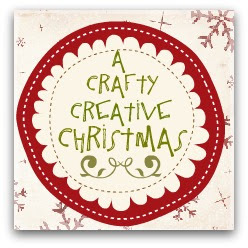 My darling Christmas blog is going to be less active after January (any gifts or makes will still appear on here), as I am developing a more day to day craft blog. I am taking my time, working on the design, figuring out what I want to use it for. I am going to invite some of my new friends to guest post on the month I launch the site and hold a themed link-up. Hopefully, this will happen in February...depending on the essay and how much of a back log it creates for me at work. 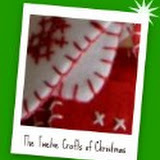 If you want to take part in the guest post welcome party, send me an idea to: 12craftsofcrimbo@gmail.com. After all, a friend is just someone you haven't met yet, right? So come and introduce yourself. In fact, email and introduce yourself even if you don't have a project! Do any of you have any new blog tips you could send to me? I'd be ever so grateful. Take care, and Happy New Year. See you on the other side of the paper, and hopefully a lot before. Time to decorate at last! This little snowball is made with coloured embroidery thread, felt, ribbon, sequins and some pinking shears. I considered decorating the tree, but it didn't look as good as I wanted it to! The heart was made with felt, ribbon, embroidery thread and beads. I had some cool snowflake sequins which formed the basis of this. The edge was sewn using a whipped back stitch, so it followed the more Norweigen style. So for the final tree, we got some wooden stars, fabric snowflakes and lights. There are some more ornaments to come, and an angel I knocked up quickly which I haven't photographed yet! It feels completely alien that, for the last few days, I have been unable to post anything, craft anything or even set up my link party. The race to pack for Christmas, so I can go away, is well under way, combined with carol concerts, birthday, work and well....packing, packing, packing! Sorry to anyone who came to link up today but couldn't, but I have been tearing around all evening, finishing final jobs etc. I might be back up and running for next week. I hope everyone's preparations are a bit calmer than mine. I am going to chill out and look around blog land for a bit. Please click on the link below to hot-foot it to my Christmas Link party. Does anyone know how to reorder posts on a blog so I can escape having to write one of these? Well I finally got around to decorating my now matured, and very nice smelling Spiced Apple Chutney. Contrary to what my friends sad, the top is definitely an apple, not a tomato. The recipe is really nice and can be found on the internet. For the original post, click here. Lavendar Hearts - For the mums! You will need: patterned fabric (scraps will do), some ribbon, some buttons, needle and thread and lavendar. I have no idea on quantities, but it's not very much! Cut out a heart pattern on paper, pin to fabric (I folded mine into 4 to get the shapes all at one time). I placed the right sides of the fabric together, pinned, machine sewed fairly close to the edge. Leave a small-ish gap for stuffing. When sewn turn around the right way. Fill with Lavendar - I think a funnel would be hugely beneficial - needless to say I had a tea spoon and my fingers. Hand sew the gap with slip stitch. Place the ribbon on each side with a button in front. Sew through the buttons until secure. And that's it. Well there you go! I will post an image of the whole present after next week, as half of it is in Germany - I need to finish wrapping it there.